A Short Swim through a Vast Ocean. 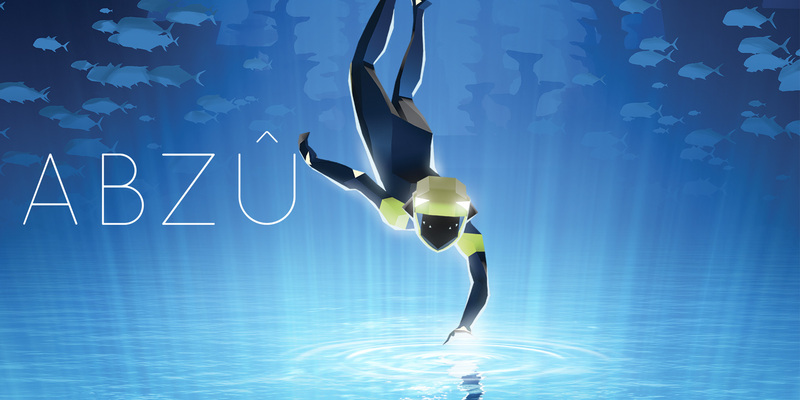 ABZÛ for Nintendo Switch comes with an artistic vision reminiscent of games like Journey® and Flower®, and was previously released on both Xbox One and PlayStation 4. Now you can take the journey through the beautiful oceanscape of ABZÛ on the go with the Nintendo Switch or enjoy a nice swim in docked mode from the comfort of your living room. ABZÛ’s story is a bit of a mystery to me as the world of technology left behind from an ancient society that proceeded our silent and nameless protagonist is never really fleshed out and many of the plot holes in the story are left to be filled by our individual imagination. The ocean walls depict various scenes of a civilization that once thrived and was inhabited by humans in what seems like an underwater Atlantis-like society. Along the way, you uncover ancient relics of that world by visiting temple structures, move chains by solving puzzles while seeking clues to the previous residents of the underwater world. The controls in ABZÛ are simple, you can move throughout the water by swimming slowly or kick to speed up your strokes in the water. You also have the ability to spin and change direction quickly and speed up even launching yourself out of the water in areas that allow you to jump above the water’s surface. Throughout the various sections of the game, you will uncover small robots which you can send to unlock doorways and activate switches found within the labyrinthian underworld. These robots are used to solve room specific puzzles where once completed they unlock a door which leads to the next room and locating the next robot. Your scuba diver also is equipped with a sonar-like ability, which is used to activate and command the robots, but it’s also used to scan for sea life and unlock species found within the game’s areas. The sonar also acts as a method in which you activate meditation statues which lets you take a break from the game and enjoy the oceanic scenery. Along ABZÛ’s short campaign through the wildlife of the underwater world and scouring the the ocean floor, you will embark on ride along with various types of sea life. In ABZÛ, you will hitch rides with sharks, dolphins, whales and more. Some of the creatures you link up with will allow you to pilot them which allows you to swim faster and reach higher heights when jumping out of the water. One uniqueness about ABZÛ is its orchestral ebbs in its score which becomes a gameplay element in and of itself. The epic accompaniment of music is the driving force in your journey through the oceans many areas as you solve puzzles and unlock new areas. The orchestral score and artistic direction of ABZÛ is its shining star in the otherwise cryptic story and mysterious undertones of a lost world. ABZÛ is a bit all over the place in terms of content. At most you are tasked with a few puzzles of varied intricacies and difficulty, none of which are real brain teasers, they just require multiple steps and visiting rooms in a linear fashion to reach the next section of the game. The game doesn’t really push you along in a rush which seems to lend to the desires of the ABZÛ’s vision to let you explore at your own pace. The thing is there isn’t much in terms of content or straying from the set path in ABZÛ which is one of the games greatest let-downs. Once you are done with the main game, you can always revisit each area to find each of the sections meditation spots, though most of those are uncovered in the initial playthrough if you seek them out in the main larger areas of the game. ABZÛ also has a nice ‘aquarium’ style viewing which lets you dive into any area of the game where you have a meditation area unlocked and streams a gorgeous scene of sea creatures along with orchestral swirls of music. That isn’t enough though to really warrant just watching the game, though it is a nice touch. ABZÛ tries to be creative and succeeds in its music and art direction, but outside of that, the game is short and ultimately a let-down. You will see most of what the game has to offer in a short 2-3 hour play through. While the game looks and sounds amazing that isn’t enough for me to give ABZÛ a high score. Your adventure is over in a short 2 to 3 hours and there isn’t much else to do in ABZÛ afterwards which is a shame, given how gorgeous the game looks and how epic the musical score can be at times.